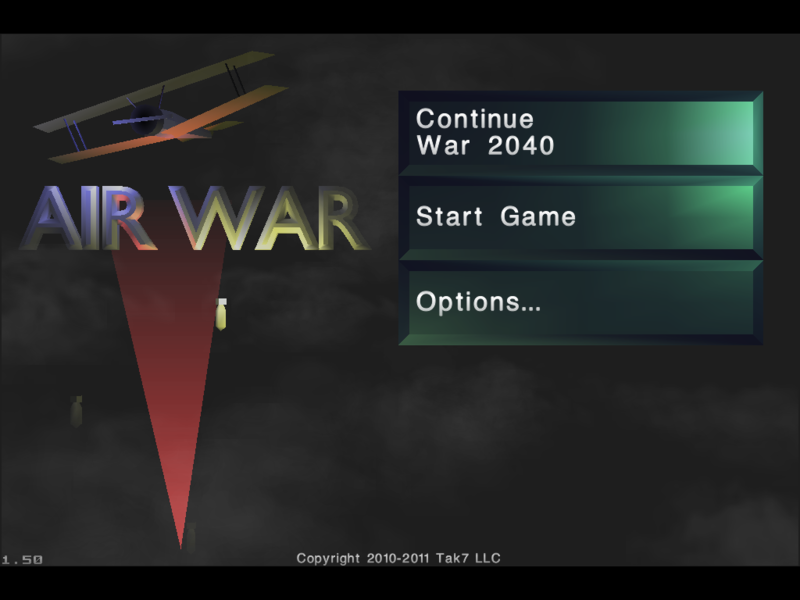 Air War is an arcade shooting game for the iPhone, iPod Touch, iPad and Mac computers. It is a universal app, which means the app is aware of the larger resolution of the iPad and uses it accordingly. 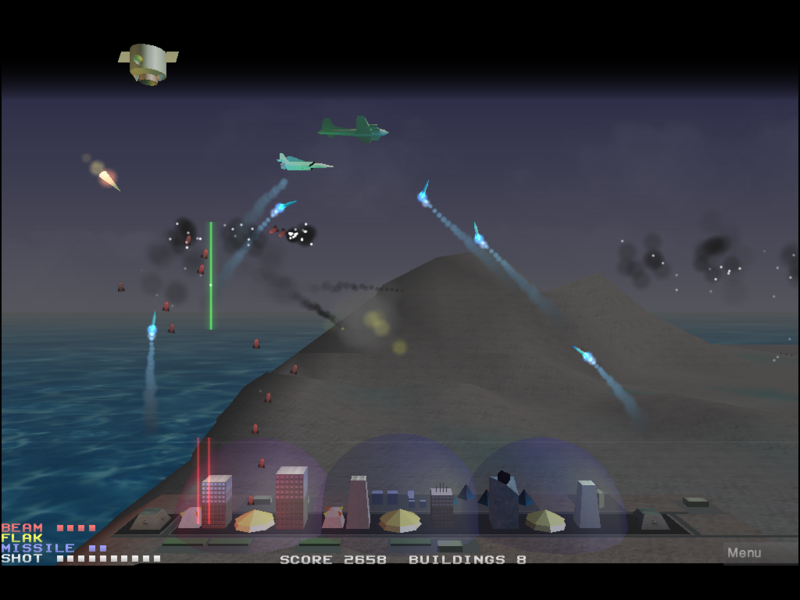 Defend Atlantis from an enemy air force over a 115 year period. 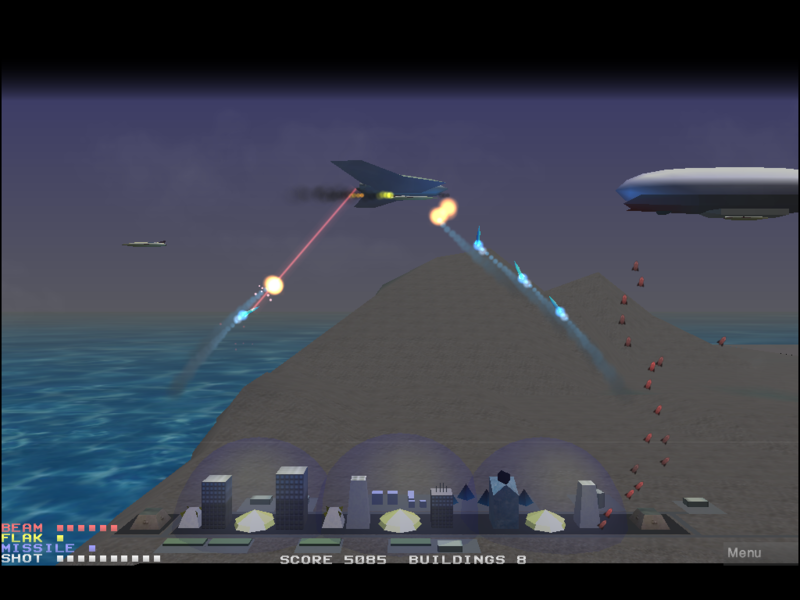 Master four weapons to destroy enemy fighters, bombers, blimps, cruise missiles, satellites, drones and ufos before they bomb and blast your buildings into rubble. 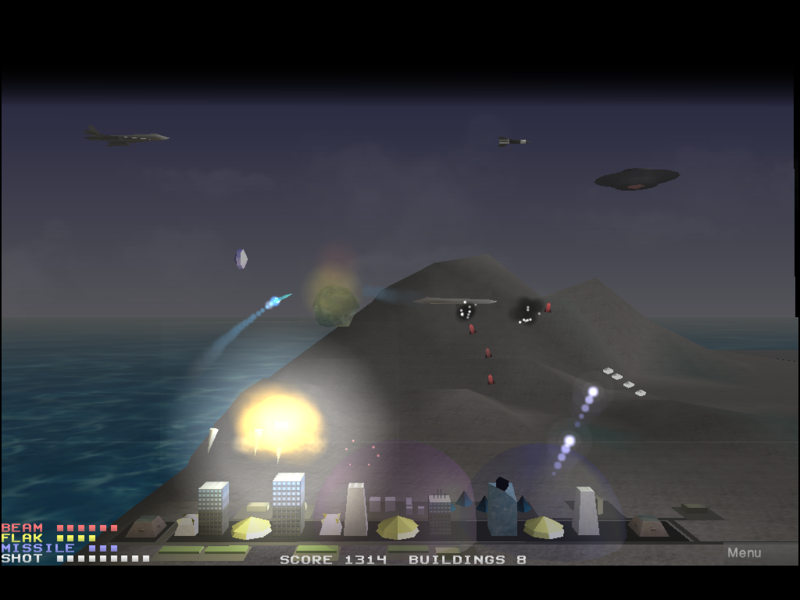 Your city consists of several buildings, shield generators and missile launchers. Shield generators create an energy dome that will protect buildings. When all the buildings are destroyed, you will lose. The city will be repaired after each year. Each weapon has an ammo bar at the bottom of the screen. The reload rate varies per weapon. A "NO AMMO" message will appear on the screen when you attempt to fire an empty weapon. Beam - Fires a laser beam from the ground at extreme velocity. Can hit orbital targets. Later versions have multiple beams and increased power. 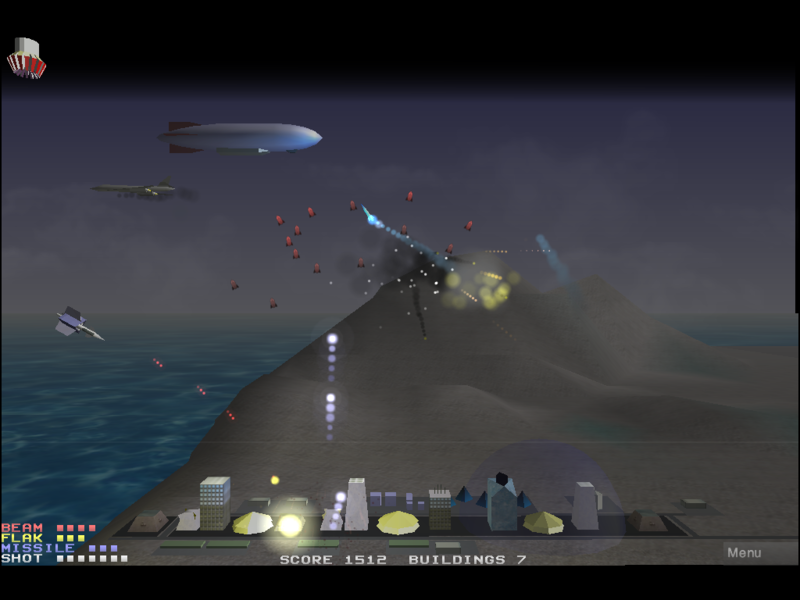 Flak - Fires several shells that detonate on impact. Low accuracy. Cannot reach the upper atmosphere. Later versions fire more shells. 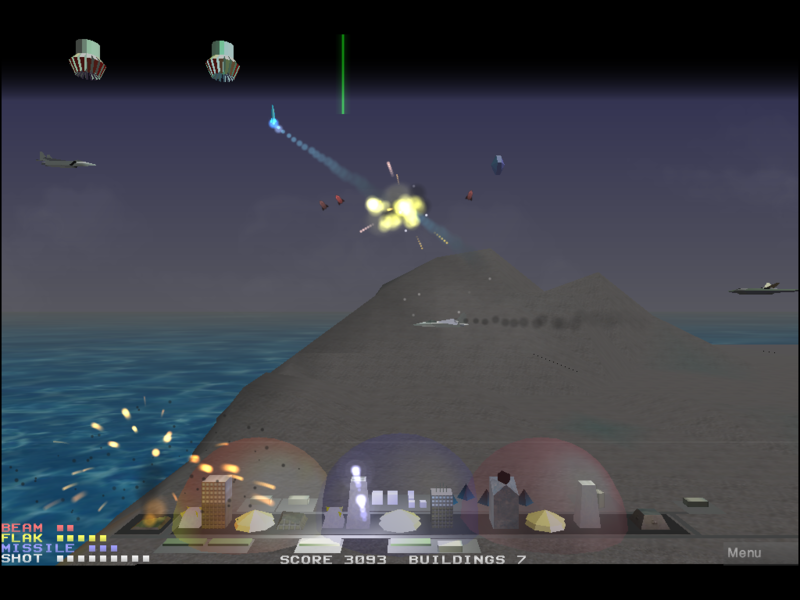 Missile - Fired from each launcher at the ends of your base. Homes in on target. Becomes available in 1940. Cannot reach orbit. Launchers can be destroyed. Shot - Fires two high energy projectiles. High accuracy. Can hit orbital targets, but low velocity requires careful aim. You can fire extra shots if you keep you finger down for a moment before releasing it, but each shot will consume another unit of ammo. Bomber - A large aircraft or blimp carrying bombs. Drops the bombs when it nears your city. 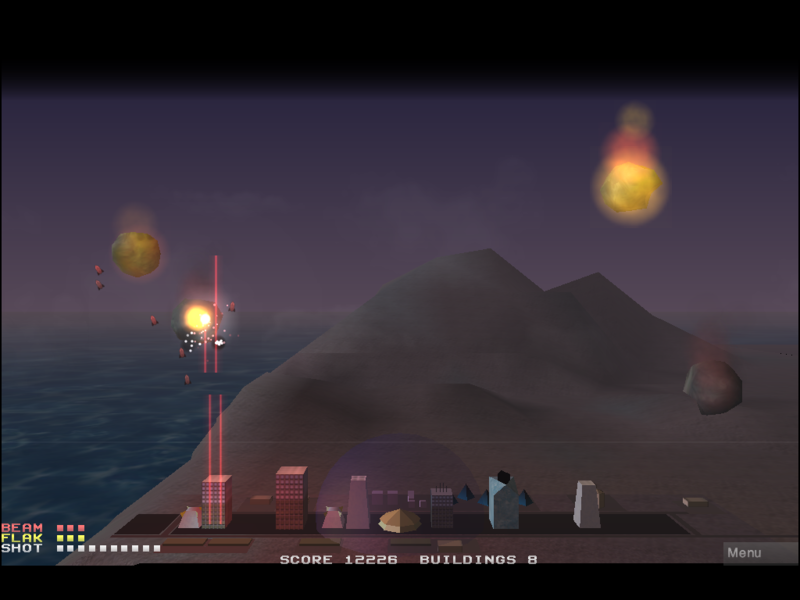 Later versions move faster and have more powerful bombs. Fighter - A small aircraft that normally escorts bombers. Fires machine guns at buildings. Later versions move faster. Cruise Missile - An fast unmanned missile that homes in on buildings. They will have one of two warheads. The conventional warhead can destroy a building in a single hit. The submunition warhead will release ten small bombs in a short time. Satellite - An unmanned orbital device equipped with a laser weapon. The beams will do some damage through shields. UFO - A highly maneuverable aircraft that comes in several sizes. Fires lasers. The larger ones are tougher and have more powerful lasers. At the end of each year, the stats page will show how you used your weapons and how accurate you were. 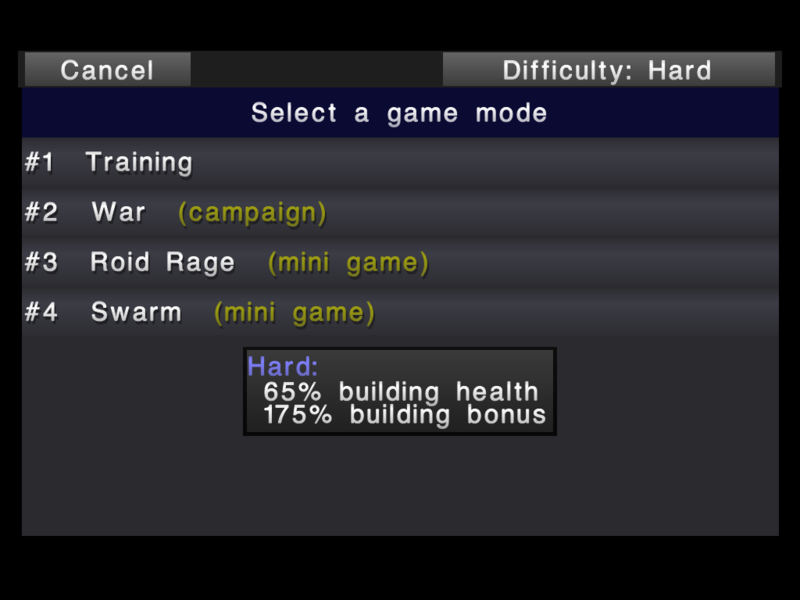 It will also show your score bonus for each building you saved. 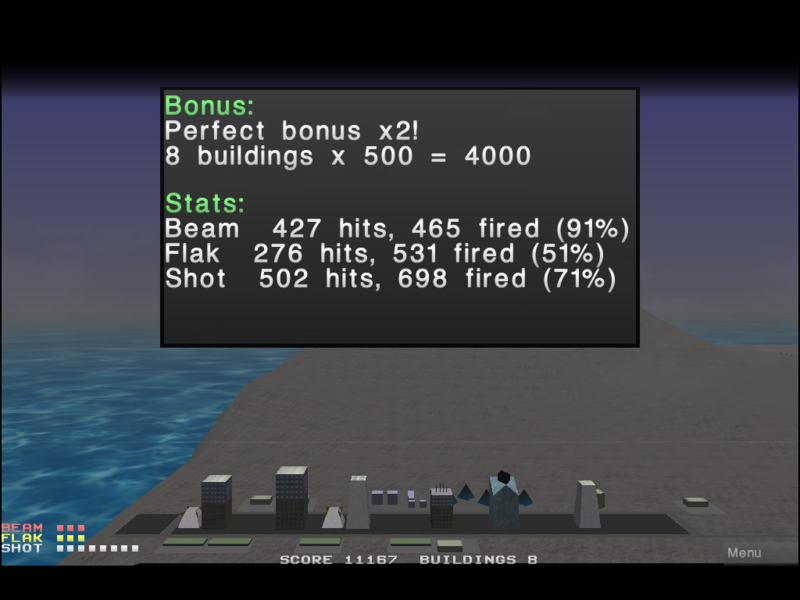 The highest score will be achieved by destroying every enemy and saving every building. 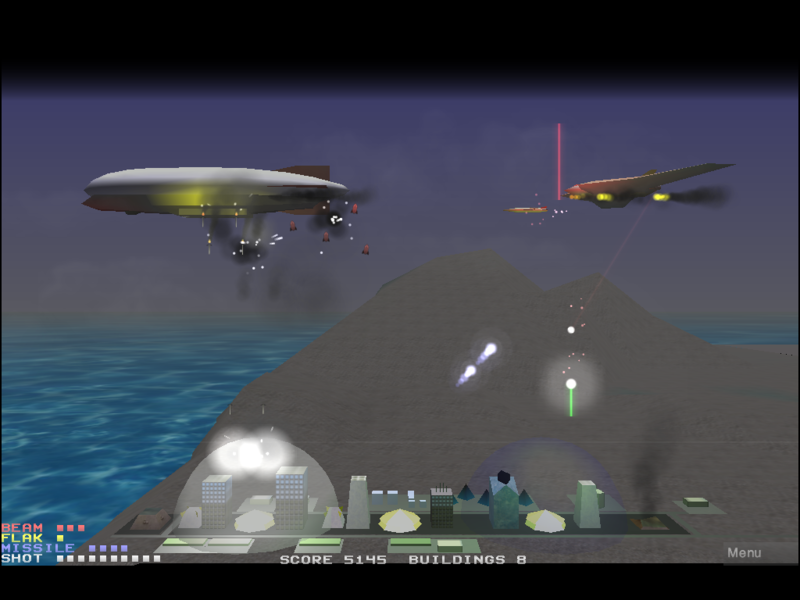 Enemies enter from the top or top left of the screen. 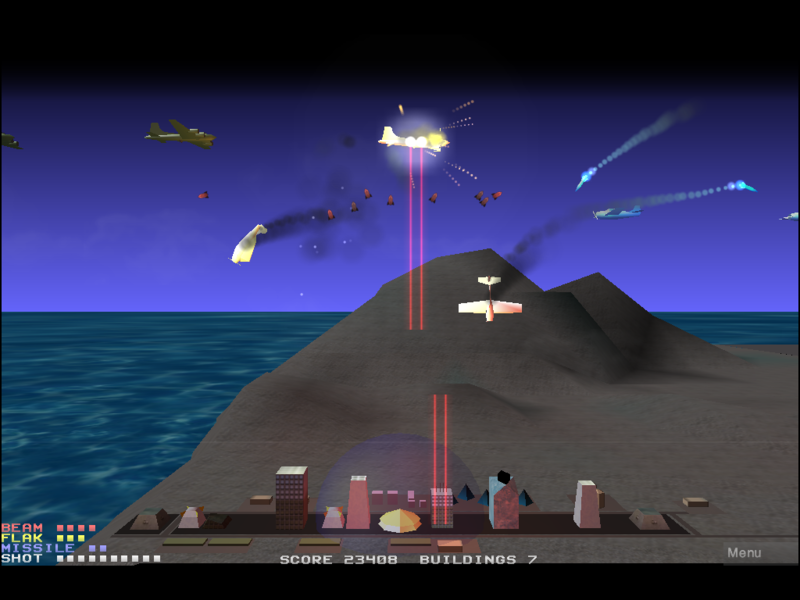 Use a wall of shots and lasers to catch the enemies at the highest altitude. Switch to flak after they drop down since it can't reach the highest altitude and this allows the other weapons to replenish their ammo. 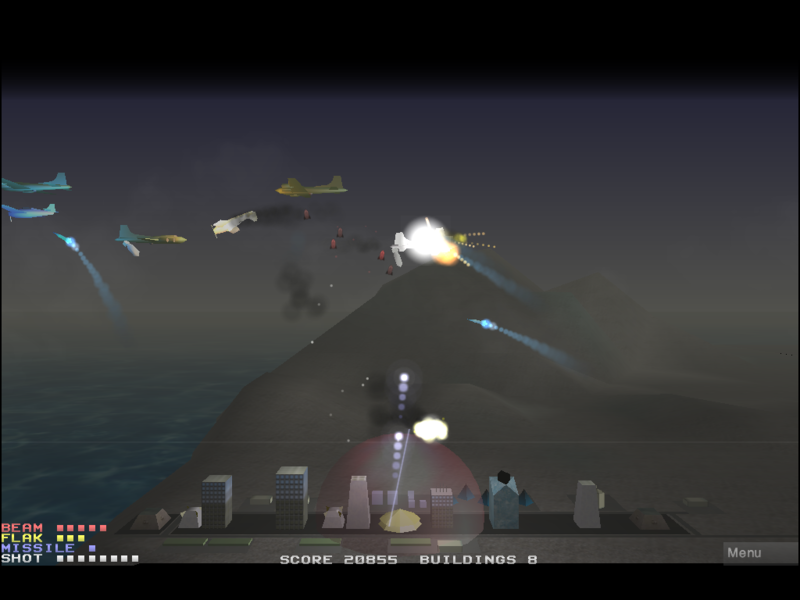 Missiles work well on bombers, so fire one missile per bomber starting with the lead bomber. When bombers get low they will start dropping bombs, which you can destroy. Any weapon can destroy them, but the dual laser works best since it is fast and accurate. Satellites will do considerable damage with their lasers if not destroyed quickly. Your laser is the best choice. 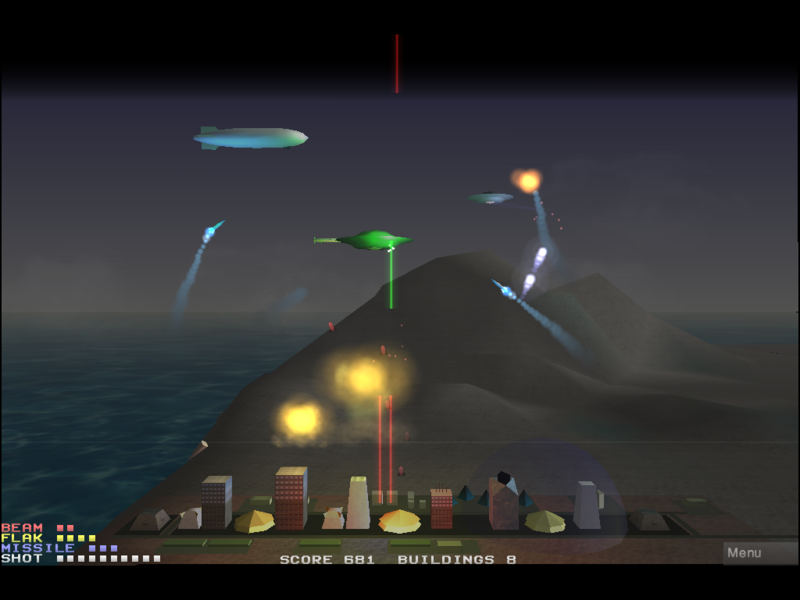 The left missile launcher is very vulnerable, since it is the first target they will see, so fire quickly nears the left edge of the screen as soon as a Satellite appears. Aircraft can fall from the sky when destroyed and some large debris may stay intact long enough to make it to the ground. This is very damaging to buildings or shields if they get hit, so shoot the debris if it looks like it will hit something. Remember to rotate between your weapons. You will run out of ammunition and the weapon will not fire if you stay on a single weapon for too long.